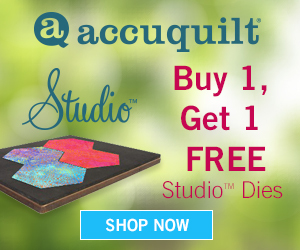 Windmills and quilts played important roles in the lives and survival of early Americans. Like the quilts made by thrifty, resourceful pioneer women, windmills are testaments to the ingenuity, creativity, and hard work of the pioneers who ventured west. Some windmills were used to grind grain into flour while others, particularly on the Great Plains where water is deep underground, pumped water to the surface. 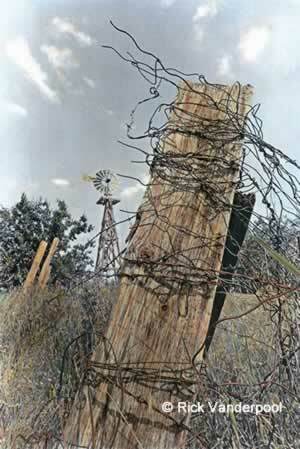 Later, in the early and mid-1900s, people in rural areas used windmills to generate electricity and charge batteries. To preserve, honor, and commemorate the roles played by windmills in the lives and cultures of the Plains, the American Wind Power Center in Lubbock, Texas, features a wide variety of working windmills. 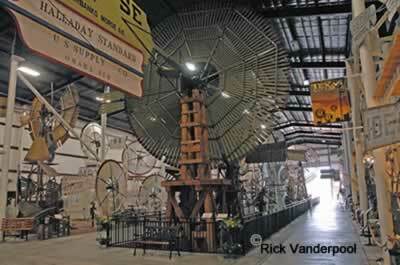 Inside the museum over 100 historic windmills, the entire history of of the American water-pumping windmill from the 1860s to the present, are displayed. Carefully restored to their original colors, metal and wood windmills on full towers, grain-grinding windmills, hand pumps and graphical depictions of the history, marketing, and erection of windmills. 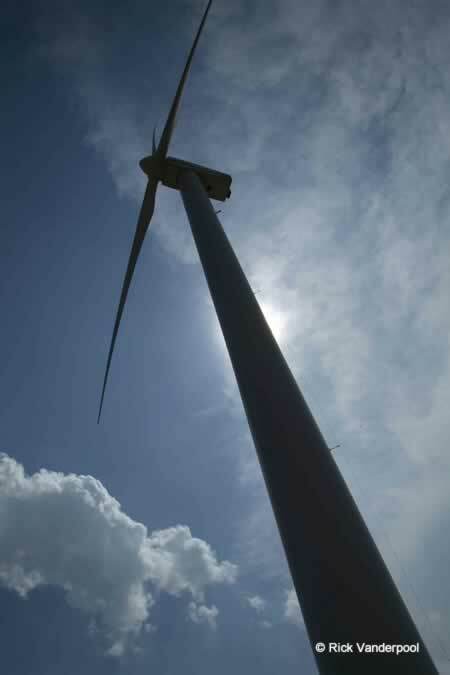 While some are small, to be used for pumping water from deep underground, others are tall, such a the Vestas Wind Turbine, which stands on a 164-foot tower with wide blades for generating electricity for the museum. Modern wind turbines, tall and simple, sometimes alone, or in a field of hundreds, now provide a significant amount of electrical power in some regions of the country. 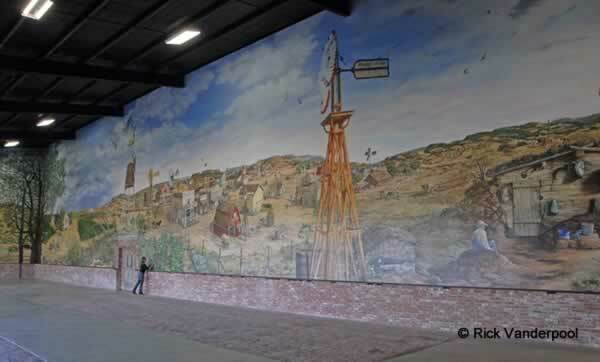 Two walls of the large indoor-outdoor patio of the museum are covered with La Gina Fairbetter's panoramic mural, Legacy of the Wind, depicting the history and influence of windmills in the lives of early Americans. 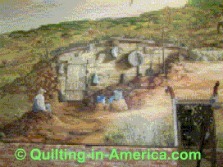 Both the windmills and quilts were critical to the survival of those early pioneers. Windmills pumped water for the people as well as the livestock and crops and ran machinery. In the simplest pioneer homes, dugouts carved from the sod of the prairie, quilts warmed the inhabitants, covered doors and windows to keep out the wind and dust, swaddled babies, or were used as burial wraps. Scarcity of materials and time required that people use it up, wear it out, make it do, or do without. 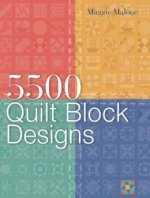 Therefore, many quilts were patchwork, functional blankets made from whatever materials were at hand. Scraps from clothing and fabric bags in which grain, tobacco, and staple goods were sold (feedsacks) were common materials for quilts. 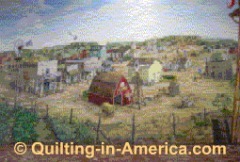 As towns were built, windmills and quilts were still very important in the everyday lives of the residents, though for different purposes. Quilts were still used for warmth, and sometimes for decoration, too. 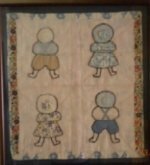 Women living in town had better access to materials and more time for elaborate stitching. 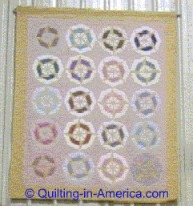 Therefore, their quilts frequently were more decorative, cherished and passed to the next generation. During the 1970s through the 1990s, Dr. Vaughn Nelson, Director of the Alternative Energy Institute at West Texas State University in Canyon, Texas, attended many wind power conventions. He nearly always received a T-shirts that represented some wind turbine company or the event itself. 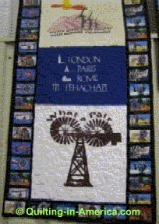 Later, Dr. Nelson had each shirt cut and sewn into a colorful memory quilt, a modern variation of a signature quilt. Most of the companies represented in this work have long since gone out of business. 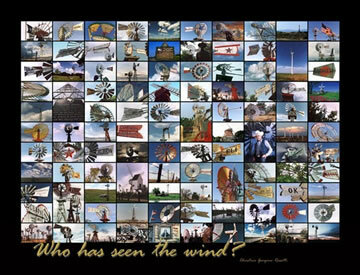 In this fine-art print with over 100 Texas windmills, Rick Vanderpool captures the wind in this beautiful historical collage of all types of windmills in the Lone Star State.